This is the fastest to erect Motorhome or Campervan Canopy and Privacy room available! The Awning functions in exactly the same way as the F45S or F45L awnings and can be used on it's own, however add the Privacy Room and the difference is quickly apparent! The two side panels simply zip straight to the awning canopy, Half of a YKK® zip is already stitched to the outer side edges of the canopy. The front panel slides into the front bar of the awning. Then just zip the corners together and you're almost done! Peg down and you're ready. The Fiamma Zip is normally purchased as a complete outfit, but you can buy the Awning only and add the Privacy room later if desired. Please remember though it does work out a little dearer. Also remember you can't use a standard Privacy room on a Zip Awning, or use a Zip Privacy room on a standard F45S! * please note, there are photographs on the wider web, not our site, showing two windows in the front panels, these are not actually available and are of an awning set up and photographed with two small front panels! Fiamma Zip Canopy 300cm is currently out of stock with our UK warehouse in both Grey and Blue. 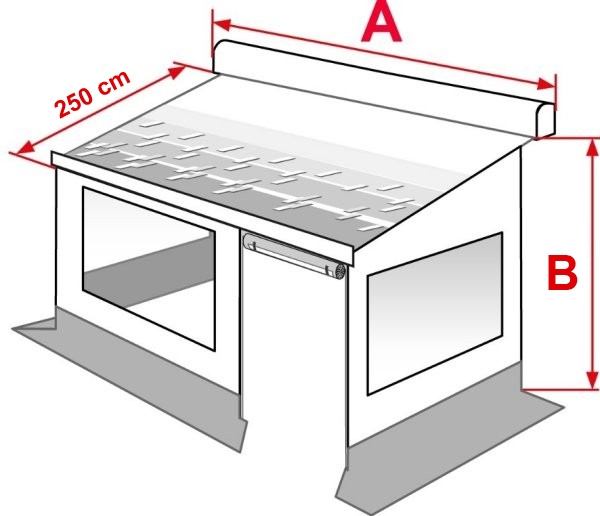 This also means the 300cm Medium and Large complete Canopy and Room is also unavailable. Stock is expected towards the end of june, but not guaranteed. To order the complete Fiamma ZIP, simply add the canopy you require and then add the corresponding privacy room to suit. product was good. delivery was not!!!!!!!!! F45 zip is lovely and works perfectly! I called Jackson as the delivery Had not arrived , they assured me it would be on time , failing that they would call me to make me aware it would not arrive.